Rover-A was launched using a Delta II 7925, a launch vehicle used successfully in 40 launches. Rover-B was launched using a Delta II 7925H, where "H" stands for "Heavy." It is a more powerful vehicle that uses larger strap-on solid rocket motors developed for the Delta III launch vehicle. The launch of the MER-B spacecraft will be the second use of a core Delta II "Heavy" launch vehicle and the first use of a Delta II "Heavy" launch vehicle with an upper stage. 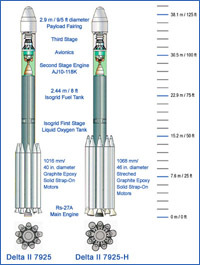 The principal differences between the two launch vehicles are the use of larger strap-on solid rocket motor for the Delta II 7925H and various structural modifications to support these larger solids. At the Cape Canaveral Air Force Station in Florida, Rover A will be launched from Space Launch Complex 17A, while Rover B will be launched from Space Launch Complex 17B. SLC-17B is the only one of the two that can accommodate the larger Delta II 7925H. Every 26 months, Earth, Mars and the Sun align for the most efficient, least energy-consuming path between Earth and Mars. The launch period for Rover A uses close to the minimum energy to get to Mars in the 2003 opportunity, while Rover B will need more energy to get to Mars. The two vehicles cannot be launched at the same time due to restrictions at the launch site and the availability of supporting teams. For a sequence of events and dates of launch periods and launch windows, please see the launch phase in the mission timeline.